Set to become the pioneering turning-point in ultra-long-haul travel, AIM Altitude today launches ULTRAFLEX, at AIX 2019. While passengers can see the benefits of skipping the traditional stopover, ultra-long-haul flights will not really be an attractive proposition until the flight experience is appealing enough to counter the length of time passengers are cabin-bound. 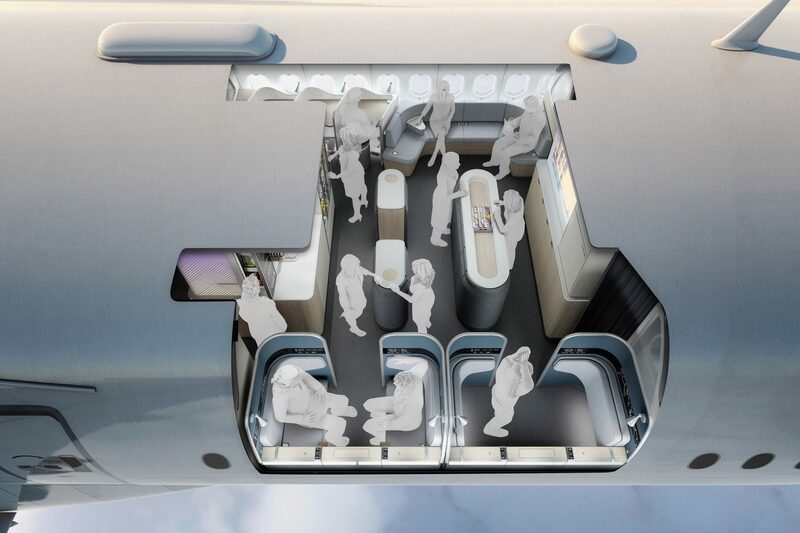 ULTRAFLEX aims to make ultra-long-haul flights enjoyable and desirable. ULTRAFLEX is a conversational starting point, embracing a new, empathetic environment that caters to passengers’ ultra-long-haul needs. It is a concept from which further solutions and refinements can be progressed to make ultra-long-haul flights a positive and successful experience for airlines and passengers alike. Relax and Dine modes enable effortless socialising. From an afternoon glass of wine with a friend, or preparing a presentation with a work colleague, to booking the booth for a special romantic meal whilst on honeymoon. Wellness and Focus modes concentrate on utilising the maximum internal volume by folding the bench seat up and stowing away the credenza table. Exercises such as popular flight yoga routines can be undertaken, and meditation guides followed, in these areas. Semi-private prayer areas can also be created by/for the passenger. A productive workspace with incorporated movement stimulation, ULTRAFLEX has three exercise stations where low-resistance exercises can be performed whilst continuing to work or sit at a desk. These stations encompass a cycle seat, step plates and a massaging muscle-roller, providing an easy and fun way to keep blood circulating well and reduce stiffness and discomfort during the flight. Exercise-released endorphins should improve mood and lessen fatigue. As well as the health benefits, these areas offer a greater degree of privacy, away from the passenger’s seat. To the rear, the units can transform into entertainment opportunities with a pop-up bar for watching live sporting events. A refined rail system allows food displays / bar snacks / glasses etc to be presented easily and securely. This can then be flipped, turning the chilled café area into an exciting cocktail bar. The forward centre Deli Galley has been conceived to tackle a growing concern that passengers feel uncomfortable approaching a traditional galley monument. They want to interact with a dedicated unit that feels designed for them. The display cabinet offers a more familiar deli-style offering, typically found in a café environment. The glazed unit allows a greater variety of visually appealing healthy snacks, light bites and hydration products to be available to the customer over these extended flight times. Product display space can also be offered to outside companies for sponsorship, generating additional revenue streams. Linking the airline to a popular food brand can lift the overall appeal of the airline. The central half-height monuments are key social pillars linking the floorplan together. Their natural height promotes open standing conversation and social interaction to take place over a wider distance. AIM Altitude has introduced bold perching pads, that mix both practicality and elegance in a familiar, contemporary interior-design styling, as well as cleverly hiding additional half-cart stowage. Passenger profiles vary greatly across individual travellers, business travellers, groups, families and couples, to name a few, but ULTRAFLEX promotes a place for all. Put simply, while ultra-long-haul flights are currently possible, ULTRAFLEX is a concept that will allow passengers to engage at a new level and, ultimately, make such flights appealing and enviable.